Shrimp culture represents an important and economically profitable venture and their production has grown enormously in recent years by intensive and semi-intensive methods of culture. Penaeid shrimps are one of the most important preferred species for culture in artificial impoundments (Megarajan Sekar et al.). Approximately more than 5 million metric tons of shrimps are annually produced but the current global demand for both the wild (naive) and farmed shrimps are approximately more than 6.5 million metric tons per annum (Karthik et al.). To overcome this, many shrimp farms are being created throughout the world to solve this increasing food demands (FAO). However, fast development of these shrimp industries and intensive culture of these farms has created various ecological, economic and social issues. During the last few years white spot syndrome virus (WSSV) disease has spread worldwide and caused large scale mortalities and economic loss in shrimp culture particularly in Asia (Danya,Jagadish). Due to the continuous outbreak of this WSSV disease in Penaeus monodon culture leading to loss of shrimp culture in India the farmers are seriously looking for alternative shrimp species for culture. In 2008, the Coastal Aquaculture Authority of India (CAA) introduced a new shrimp species Litopenaeus vannamei as an alternative to Penaeid species in India to culture and export. Since the Litopenaeus vannamei exhibits fast growth rate and its culture period is significantly shorter compared to Penaeus monodon and it has been selected as best alternative to Penaeus monodon in shrimp farming in several countries such as, East, Southeast and South Asia (Karuppasamy, et al. 2013). In general, shrimp ponds are enclosed cultivation systems, subject to periodic water renewal to compensate for volume changes (due to evaporation) and salinity changes (evaporation, precipitation) and to maintain water quality. The excess feed and faecal matter may result in bacterial decomposition of organic matter in the sediment and produce excess of toxic compounds like ammonia. In addition abnormal algal growth (eutrophication) may cause stress to the animal and ultimately end with microbial diseases and high mortality. Moreover, the effluent from shrimp ponds is often a water quality hazard, due to higher organic loading, very limited research has been carried out on the culture, growth performance and disease management of L. vannamei. The present study was carried out to evaluate the effect of consortium of a Bacillus stratosphericus, Nitrosomonas sp and Nitrobacter sp in L. vannamei shrimp culture at laboratory scale experiments to enhance production and to set as an ecofriendly practises. The bacterial strains namely Bacillus stratosphericus (AMET1601) was isolated from the marine sediment samples and identified by biochemical examination using Bergey’s Manual of Determinative Bacteriology (1989) and also by 16s rRNAsequencing. The antimicrobial activity of the strain was determined by testing against different seafood borne bacterial pathogens (E.coli, V. cholerae, V. parahaemolyticus, V. harveyi, V. alginolyticus, V. fischeri, Salmonella sp. and Shigella sp. (previously isolated from infected seafood samples) and the antagonistic activity between the bacterial strains also determined by agar well diffusion assay (Schillinger and Lucke 1989, Karthik et al. 2013). The bacterial strain Bacillus stratosphericus (AMET1601) was separately grown in nutrient broth in a shaking incubator at 30°C for 24 hr. After the incubation period, the cells were harvested by centrifuging at 2000 rpm and the obtained pellet was washed twice with phosphate-buffered saline (pH 7.2) and re-suspended in the same buffer. Then, the absorbance at 600 nm was adjusted to 0.25 ± 0.05 in order to standardize the number of bacteria (106CFU mL-1) by dilution plating method. The commercial shrimp feed (Blanca feed pellets, obtained from CP Aquaculture India Pvt Ltd) was taken for the supplementation of each bacterial strains. In order to reach a final concentration (106 CFU g-1) the bacterial suspension was slowly sprayed onto the feed for mixing, the feeds were named as Feed 1, Feed 2 and Feed 3 respectively according to the bacterial strains. The amount of bacterial load in the feed was determined by standard plate count method (Ajitha et al. 2004; Karthik et al. 2014). The sediment samples were collected from the bottom of shrimp culture pond located at nearby area of Kalpakkam, East Coast of Tamil Nadu, India. The collected sediment sample (10g) was suspended in 90 ml sterile 50% seawater blank. After vigorous shaken, it was serially diluted up to 10-6 and the dilutions such as, 10-4, 10-5 and 10-6 were taken for isolation of Nitrosomonas sp using Winogradsky phase I medium (Containing (NH4)2SO4, 2.0g; K2HPO4, 1.0g; MgSO4.7H2O, O.5g; NaCl, 2.0g; FeSO4.7H2O, 0.4g; CaCO3 0.01, agar 15.0g; Distilled water 1000ml) and for Nitrobacter sp by Winogradsky phase 2 medium (Containing KNO2 0.1g; Na2-Co3,1.0g; NaCl, 0.5g; FeSO4.7H2O, 0.4g agar 15.0g; Distilled water 1000ml) using pour plate technique. All the plates were incubated at room temperature (27± 2°C) for 7-14 days. After the incubation period morphologically different colonies were selected and sub-cultured in the respective medium plates and they were identified by their morphological characteristics and gram reaction (Okpokwasili and Odokuma, 1996 a,b; Colwell and Zambruski , 1972). In addition, the Nitrosomonas sp strains were confirmed by their ability to accumulate nitrite in broth containing NH4+ as well as Nitrobacter sp strains by the accumulation of nitrate in broth containing NO2- (Akponah et al., 2014). The potential Nitrosomonas sp and Nitrobacter sp strains were mass cultured in a 2L fermentor by using sodium nitrite (0.25mg NaNO2/l Winogradsky broth) and ammonium sulphate (5.0mg (NH4)2SO4/l Winogradsky broth) as medium for Nitrobacter sp and Nitrosomonas sp respectively with proper pH (8), temperature (28°C), agitation (200rpm) and aeration (at the rate of 0.6L min"1). The fermentor was covered with a black cloth to protect the culture from light inactivation. When the rate of substrate uptake and product formation declined (indicating the attainment of stationary phase) the culture was harvested by centrifuging at 8000rpm for 20 minutes at 4°C. The obtained culture filtrate was washed with fresh medium and re suspended in corresponding medium (containing 10μg mL-1 substrate) and it was stored in air tight container at 4°C. Then, the absorbance at 600nm was adjusted to 0.25 ± 0.05 in order to standardize the number of bacteria (106CFU mL-1) it was subjected to dilute plating method. The microalgae such Cheatoceros calcitrans was obtained from AMET Microbial Culture Collection Centre, Department of Marine Biotechnology, AMET University. The shrimp (nauplii 24hr) of Litopenaeus vannamei were obtained from a commercial shrimp hatchery located in Marakanam, Kanchipuram District, Tamil Nadu, India. They were kept in seawater with aeration for a period of 6hr in order to avoid any stress to the animals and then used for the experiments. The experiments were conducted at the Department of Marine Biotechnology, AMET University, Chennai. A total of six 100L glass tanks were filled with 70L of filtered seawater at 32% salinity and kept at ambient temperature (28 ± 1°C) and aerated continuously. The seeds were transferred in the tanks with a stocking density of 75 nauplii per litre. The Zoea of Litopenaeus vannamei kept in the experimental tanks was fed with Cheatoceros calcitrans. On 1st day of the Zoea (Z) of I- III stages were fed thrice with 30 × 104 cells/mL of algal cells. On the 2nd day of the Mysis (M) (I- III/Postlarve 1) of Litopenaeus vannamei were fed thrice with 40 × 104 cells/mL of algal cells. From 3rd day up to 20th day they were fed thrice with 3-8 No/mL of Artemia salina nauplii enriched with Cheatoceros calcitrans. The 24hr old Artemia salina nauplii enriched with Cheatoceros calcitrans for a period of 24hr was fed to Litopenaeus vannamei. Filtered seawater was exchanged daily and the debris settled at the bottom was siphoned out without disturbing the animals. This experiment was conducted for a period of 20 days (PL20). At the end of the experiments the animals from all the experimental tanks were randomly selected and the survival rate and the average length were recorded. A total of 150 Litopenaeus vannamei seeds (post larval stage 21, that had been acclimated to a salinity level of 32% and confirmed negative for the White Spot Syndrome Virus (WSSV) and Taura Syndrome Virus (TSV) by the polymerase chain reaction), were taken for the experimental study. The average weight of the shrimps were divided into three batches 100L glass tanks (70L of seawater), each containing 50 post larvae. The Tank 1 was treated with commercial Blanca feed pellets and the Tank 2 and 3 were treated through the Blanca feed pellets supplemented with 105 CFU g-1 of Bacillus stratosphericus (AMET1601) respectively and the experiment was carried for 30 days. During the culture period, shrimp in all groups were fed thrice daily at 9am, 1pm and 5pm with proper aeration and the water temperature was maintained at 28 ± 1°C and the salinity at 17 ppt. After 30 days of culture the average weight and the survival (%) of the shrimp and the microbial load in the culture water was recorded (Sivakumar et al. 2012). After 30 days of culture, in tank 3 the ammonia and nitrite oxidizing bacterial strains such as, Nitrosomonas sp and Nitrobacter sp strains (each in the range of 105ml-1) were added at only once on the 31st day. Then the Ammonia (NH4 +), Nitrite (NO2) and Nitrate (NO3) concentration in the water was recorded from 31st day to 40th day. On 40th day the average weight and the survival (%) of the shrimp and the microbial load in the culture water was recorded in all the control and experimental tanks. The physico-chemical parameters such as temperature, transparency, dissolved oxygen, pH, nitrite, nitrate, ammonia of water were estimated by following the methods suggested in Golterman and Clymo (1969); Wetzel and Likens (1979); APHA (1999). Shrimps and the bottom water samples were taken from from all the control and experimental tanks. Total heterotrophic bacteria (THB) and Vibrio sp load in the culture water was enumerated by growth on Zobell Marine agar and TCBS agar (Himedia, India) respectively. Moreover the ammonia and nitrite oxidizing bacterial strains such as, Nitrosomonas sp and Nitrobacter sp load also recorded on 40th day using Winogradsky phase I and phase II medium (Sivakumar et al., 2012; Karthik et al., 2013; Akponah et al. 2014). The successful shrimp farming depends upon the maintenance of water quality and the dynamic balance between beneficial probiotic and pathogenic bacteria. Water quality control and microbial community balance are necessary for successful shrimp cultivations (Sandifer & Hopkins). In general, traditional and non-scientific shrimp farms depend upon the shrimp seeds caught from the wild or those entered with the tides for stocking. Such seeds collected naturally from tides may have fortuitous infection with microbes and bound to affect shrimp culture. There is a demand for healthy and quality seeds throughout the year. Thus the successful shrimp culture is dependent upon stocking disease free, healthy seeds in the hatcheries (Soundarapandian and Babu). The applications of microalgae for aquaculture are associated with nutrition and other biological activities (Hemaiswarya, et al.). The Zoea of Litopenaeus vannamei kept in the experimental tanks was fed with Cheatoceros calcitrans and enriched Artemia salina up to PL20. The use of beneficial bacteria (probiotics) to control or inhibit the pathogenic bacteria by competitive processes is a more efficient disease control strategy than administering antibiotics. In this study, the Bacillus stratosphericus (AMET1601) strain was isolated from marine sediment samples, the strain was potentially chosen for this study due to its strongest antagonistic activity against different seafood bacterial pathogens. Moreover, preventing the shrimp culture pond from eutrophication also controls the shrimps from microbial diseases and mortality. In general, the aaccumulation of high level of ammonia is detrimental in aquaculture systems (Manju et al.). The most commonly used ammonia “removal” process in aquaculture and wastewater treatment is nitrification. Shan and Obbard (2003) reported that reduction of TAN in aquaculture system can be facilitated by providing and maintaining an optimum environment condition for nitrifying bacteria. Nitrification is the aerobic oxidation of ammonia to nitrite followed by the aerobic oxidation of nitrite to nitrate. Nitrification is a two step process in which ammonia is oxidized to nitrite by ammonia oxidizing bacteria (AOB) or ammonia oxidizing archaea (AOA) and nitrite is then oxidized to nitrate by nitrite oxidizing bacteria (NOB). In the present study, morphologically five different Nitrosomonas sp strains (AMETNM01 to AMETNM05) and three different Nitrobacter sp strains (AMETNB01 to AMETNB03) were isolated from shrimp pond sediments and water samples. From these, the Nitrosomonas sp AMETNM01 and Nitrobacter sp AMETNB03 strains were chose as potential microbes based on their effectiveness in accumulating nitrite and nitrate in broth. The use of probiotics in aquaculture might represent a valuable mechanism to increase shrimp growth and survival rate. In general, the gastro intestinal tract (GIT) of the aquatic animal is mainly composed of gram negative bacteria (Vine et al.). So, the incorporation of beneficial gram positive (probiotic) bacteria in feed can modify the gastro intestinal tract (Vieira et al). In the present study, the potential strain Bacillus stratosphericus (AMET1601) was incorporated in the range of 106CFUg-1 in shrimp feed using standard protocols. The Bacillus stratosphericus (AMET1601) incorporated feeds were fed to the shrimps in the experimental tanks (2 and 3) and the control diet was fed to the shrimps in control tank. The experiment was carried out for 30 days with zero water exchange. During the culture period the water temperature was maintained at 28 ± 1°C. On checking the microbial load in the culture water in both control and experimental groups on 30th day, the higher total heterotrophic bacterial count was observed in culture water (3.8 ± 0.2 × 107) in control groups (tank 1) fed with unsupplemented control diet. The count decreased in (tank 2) culture water (1.7 ± 0.2 × 108) and (tank 3) culture water (1.7 ± 0.2 × 108) groups fed with probiotic Bacillus stratosphericus (AMET1601) supplemented feed. Higher vibrio load also was observed in culture water (1.0 ± 0.2 × 108) in control groups (tank 1) fed with unsupplemented control diet. However it was slightly decreased in (tank 2) culture water (0.1 ± 0.2 × 108) and (tank 3) culture water (0.2 ± 0.2 × 108) groups fed with probiotic Bacillus stratosphericus (AMET1601) supplemented feed (Table 1). While assessing other pathogenic microbial load in the culture water using MPN technique, the maximum load was observed in the control groups and minimum in the experimental groups, the difference was statistically significant. Not even a single colony of Nitrosomonas sp and Nitrobacter sp obsereved in both control and experimental groups on 30th day. Buttner et al. (1993) have suggested that maintaining an optimal environment conditions such as water pH between 7 to 9 and temperature of about 24 to 30°C in the hatchery, will increase the utilization of TAN by nitrifying bacteria. Table 1: Experimental setup for probiotics administration in feed. Nitrogen applications in excess of ponds assimilatory capacity can lead to deterioration of water quality through the accumulation of toxic nitrogenous compounds such as, ammonia and nitrite with toxicity to shrimp (Ayyappan and Mishra 2003). According to Chen et al. ammonia can increase to more than 0.8mg.L-1 ammonia-N during shrimp larval development in a hatchery, in spite of frequent water exchange. They found that when ammonia-N and nitrite-N increased to 808.4 and 118.1μg.L-1 respectively, survival of PL was 4% inspite of water exchange. In another instance, no PLs survived when ammonia-N increased from 25.3 to 269.1μg.L-1 and NO2-N increased from 0.8 to 78.3μg.L-1 although one third of water was changed. So, in this study after 30 days of culture in tank 3 the ammonia and nitrite oxidizing bacterial strains such as, Nitrosomonas sp and Nitrobacter sp strains (each in the range of 105mL-1) were added at only once on the 31st day. 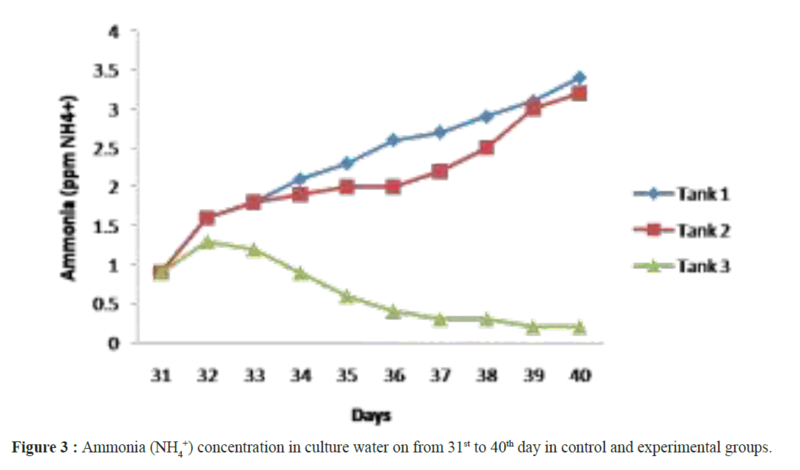 When checking the microbial load in the culture water from both the control and experimental groups on 30th day, the higher total heterotrophic bacterial count was observed in shrimp culture water (5.0 ± 0.4 × 106) in control groups (tank 1) fed with unsupplemented control diet, and it was slightly decreased in (tank 2) culture water (1.3 ± 0.2 × 108) and (tank 3) culture water (1.1 ± 0.02 × 108) groups fed with probiotic Bacillus stratosphericus (AMET1601) supplemented feed. Moreover, the higher vibrio load also observed in culture water (4.5 ± 0.4 × 108) at control groups (tank 1) fed with unsupplemented control diet, however it was slightly decreased in (tank 2) water (7.1 ± 0.2 × 108) and (tank 3) culture water (6.1 ± 0.02 × 108) groups fed with probiotic Bacillus stratosphericus (AMET1601) supplemented feed. Similarly, not even a single colony was isolated from culture water samples in control groups fed with unsupplemented control diet, but it was increased in (tank 2) culture water (1.1 ± 0.33 × 106) and (tank 3) culture water (2.1 ± 0.2 × 106) groups fed with probiotic Bacillus stratosphericus (AMET1601) supplemented feed. When assessing other pathogenic microbial load in the ulture water using MPN technique, the maximum load was observed in the control groups and minimum in the experimental groups. Not even a single colony of Nitrosomonas sp and Nitrobacter sp observed in tank 1 and tank 2 but it was increased in (Nitrosomonas sp (0.2 ± 0.2 × 108) and Nitrobacter sp (0.6 ± 0.2 × 108)) culture water samples in the tank 3 experimental groups on 40th day (Table 2). After 40 days of culture, the maximum shrimp survival (%) and the mean final weight was observed in tanks 3 were treated with Bacillus stratosphericus (AMET1601) supplemented feed and where the Nitrosomonas sp and Nitrobacter sp (Figures 1 and 2). The higher survival of shrimps fed with probiotic supplemented feed might be related to an immunopotentiation effect of probiotics on the shrimps immune system. It is of interest to note that, the probiotics are the main microbes which produce extracellular compounds to stimulate the non specific immune response in vertebrates (Marteau et al. Gill). Checking the Ammonia (NH4+), Nitrite (NO2) and Nitrate (NO3) in all the tank water from 31st day to 40th day the ammonia and nitrite concentration decreased and the nitrate concentration increased in tank 3 where the Nitrosomonas sp and Nitrobacter sp were inoculated, its Confirming their nitrification roles inside the water (Figures 3-5). Padmavathi et al., (2012), also observed similar results, in fish cultures of species Pangasius sutchi, Catla catla and Labeo rohita when treated with probiotics Nitrosomonas and Nitrobacter species. Maya et al., (2013) also reported that, shrimp PLs in tanks treated with immobilized ammonia oxidizing bacteria had significantly (P<0.05) higher survival rate (72.44%) and specific growth rate (12.86%) compared to other treatments. Millamena (1990) also reported that, maintaining low TAN concentration during experimental period can increase the shrimp growth rate (SGR) of shrimp PLs. 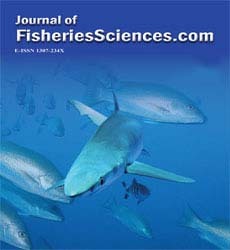 In the light of the previous reports and also the results of the present investigation suggest that the consortium of probiotic bacteria and the nitrifiers both contribute to both shrimps survival and reduction of toxic nitrification, morbidity and mortality in Litopenaeus vannamei culture systems. Figure 1: Survival (%) of shrimps on 40th day in the control and experimental tanks. Figure 2: Mean final weight gain of shrimp on 40th day in the control and experimental tanks. 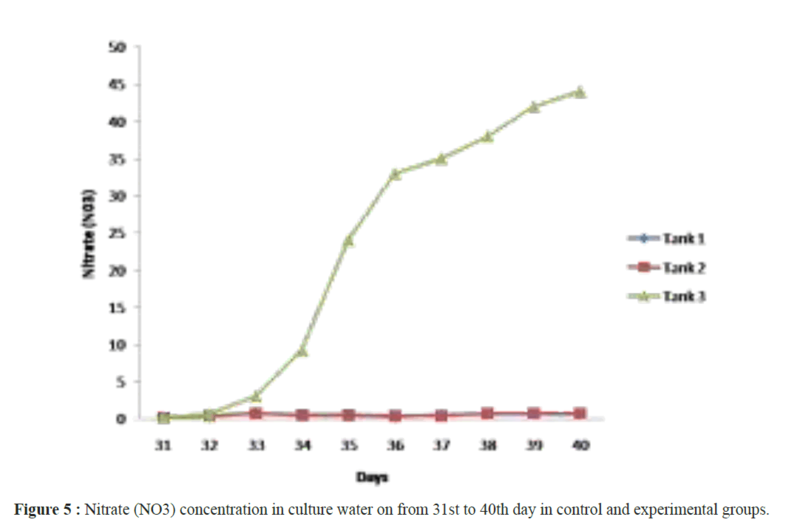 Figure 3: Ammonia (NH4 +) concentration in culture water on from 31st to 40th day in control and experimental groups. Figure 4: Nitrite (NO2) concentration in culture water on from 31st to 40th day in control and experimental groups. Figure 5: Nitrate (NO3) concentration in culture water on from 31st to 40th day in control and experimental groups. Table 2: Microbial load on shrimp intestine and culture water on 40th day in both control and experimental groups. The present study has clearly demonstrated that the use of probiotic and nitrifying bacterial consortium in shrimp culture at laboratory scale experimental conditions increased the shrimp survival and reduced the ammonia and nitrite toxicity. Based on the water quality parameters and shrimp survival (%), it is concluded that the tank 3 (Consortium of Bacillus stratosphericus (AMET1601), Nitrosomonas sp AMETNM01 and Nitrobacter sp AMETNB03) was found to be superior as compared to other two tanks (1 and 2). The work also suggests that, the extrapolation of the present study in fields and the use of these beneficial bacterial strains in shrimp culture will definitely prevent the aquaculture ponds from undergoing eutrophication and can control the microbial diseases to the shrimps and enhance their production in an ecofriendly ambience without antibiotics but with probiotics and nitrifiers. Akponah E, Otutu JO, Akpomie OO&Ubogu M. (2014). Evaluation Of The Acute Toxicity Of Three Locally Synthesized Dyes (3,5-Dimethoxypyrimidine Azo-6- Methyl Urazil, 5-Ethoxybenzothiazole Azobenzoloxyphenol And 4-Ethyl 5,2,3-Thiazole Azo-6-Methyl Uracil) Using Nitrosomonas Sp And Nitrobacter Sp. The Asia Journal of Applied Microbiology.1: 18-25. Ajitha S, Sridhar M, Sridhar N, Singh IS B,Carghese V. (2004). Probiotic effects of lactic acid bacteria against Vibrio alginolyticus in Penaeus (Fenneropenaeus) indicus (H. Milne Edwards). Asian Fish. Sci.17: 71-80. American Public Health Association, American Water Works Association, Water Environment Federation. (1999). Ayyappan S, Mishra S. (2003). Bioamelioration in aquaculture with a special reference to nitrifying bacteria.In Aquaculture Medicine, [Singh ISB, Pai SS, Philip R, Mohandas A. (eds.)]. India: CFDDM, CUSAT. pp.89-107. Bergey's Manual of Systematic Bacteriology.(1984). Vol. 2 Williams & Wilkins, Baltimore Md. Buttner JK., Soderberg RW, Terlizzi DE.(1993). An introduction to water chemistry in freshwater aquaculture. Northeastern Regional Aquaculture Center Fact Sheet No. 170. University of Massachusetts. North Dartmouth, Massachusetts. P.4 . Colwell R.R, Zambruski M.S. (1972). Methods in Aquatic Microbiology. University Park Press, Baltimore/Butterworth and Co. Publishers Ltd, London.P.453. Chen J.C, Chin T.S, Lee C.K (1986). Effects of ammonia and nitrite on larval development of the shrimp Penaeus monodon. In: The first Asian fisheries forum (eds. J.L. Maclean, L.B. Dizon and L.V. Hosillos).657-662 pp. Asian Fisheries Society, Manila, Philippines. Danya B.R,Jagadish N.M (2014). Effect of Density On Growth And Production Of Litopenaeus Vannamei Of Brackish Water Culture System In Summer Season With Artificial Diet In Prakasam District, India. AIJRFANS. 14-108; 10-13. Food and Agriculture Organization. (2012). The state of world fisheries and aquaculture 2012. Food and Agriculture Organization (FAO) of the United Nations, Rome, Italy. Gill H.S (2003). Probiotics to enhance anti-infective defences in the gastrointestinal tract.Best.Pract. Res. Clin. Gastroenterol.17:pp755-73. Golterman H.L,Clymo R.S (1969). Methods for Chemical Analysis of Fresh Waters. Oxford, Blackwell Scientific Publications. Karuppasamy A, Mathivanan V, Selvisabhanayakam (2013). Comparative Growth Analysis of Litopenaeus Vannamei in Different Stocking Density at Different Farms of the Kottakudi Estuary, South East Coast of India. IJFAS; 1(2):pp.40-44. Karthik R, JaffarHussain A,Muthezhilan, R(2014). Effectiveness of Lactobacillus sp (AMET1506) as Probiotic against Vibriosis in Penaeus monodonand Litopenaeus vannamei Shrimp Aquaculture.Biosciences Biotechnology Research Asia.11,pp.297-305. Marteau P, Seksik P, Jian R(2002). Probiotics and intestinal health effects: a clinical perspective, Br. J. Nutr., v.88, pp.S51-S57. Manju N.J., Deepesh V, Achuthan C, Rosamma P, Singh.I.S.B(2009).Immobilization of nitrifying bacterial consortia on wood particles for bioaugmenting nitrification in shrimp culture systems, Aquaculture.294,65-75. Maya Erna N, Banerjee S,Shariff M, Yusoff F.M (2013). Screening, identification and immobilization of ammonia oxidizing bacteria consortium collected from mangrove areas and shrimp farms. Asian Journal of Animal and Veterinary Advances.8, 73-81. Megarajan Sekar, Shiva Dhar Singh, Subodh Gupta (2014). Cloning and characterization of Pangasianodon hypophthalmus growth hormone gene and its heterocogous expression. Applied Biochemistry and Biotechnology 173, 1446-1468. Millamena O.M (1990). Organic pollution resulting from excess feed and metabolite build-up: effect on Penaeus monodon postlarvae. Aquacultural Engineering.9,143-150. ObbardJ.P, Shan H (2003). Ammonia removal from freshwater using nitrifying bacteria enriched from a seawater aquaculture pond. Biotechnology Letters.25, 1469-1471. Okpokwasili G.C L.O, Odokuma L.O(1996a. )Response of Nitrobacter sp. to toxicity of drilling chemicals. J. Pet. Sci. Engr. 16, 81-87. Okpokwasili, G.C. &Odokuma L O (1996b). Tolerance of Nitrobacter sp. to toxicity of hydrocarbon fuels. J. Pet. Sci Engr. 16, 89-93. Padmavathi P, Sunitha K,Veeraiah K (2012). Efficacy of probiotics in improving water quality and bacterial flora in fish ponds.African Journal of Microbiology Research.6(49): 7471-7478, 25. Ramachandran Karthik, Subashchandra bose, Gobalakrishnan, Ajmath Jaffar Hussain, Radhakrishnan Muthezhilan(2013). Efficacy of Bacteriocin from Lactobacillus Sp. (AMET 1506) as a Biopreservative for Seafood’s Under Different Storage Temperature Conditions, Journal of Modern Biotechnology.2,59-65. Sivakumar N, Sundararaman M, Selvakumar G. 2012. Probiotic effect of Lactobacillus acidophilus against vibriosis in juvenile shrimp (Penaeus monodon).African J Biotechnol.11(91): 15811-15818. Sandifer P.A, Hopkins J.S(1996).Conceptual design of a sustainable pond-based shrimp culture system.Aquacultural Engineering.15, 41-52. Vine N.G, Leukes W. D, Kaisher H (2006). Probiotics in marine larviculture, FEMS Microbiol.30, 404-427. Vieira F.N, Pedrotti F.S, Neto C.C.B, Mouriño J.P, Beltrame E, Martins M.L, Ramirez C, Arana L.A.V(2007). Lactic-acid bacteria increase the survival of marine shrimp, Litopenaeus vannamei, after infection with Vibrio harveyi. Braz. J. Oceanogr., 55,251-255. Wetzel R.G, Likens G.E (1979). Limnological Analyses. W. B. Saunders Co., Philadelphia. P.357.